Charter schools were an idea imported by the Act Party from the same US political wingnuts that gave us the ‘three strikes’ sentencing policy. At base, the charter schools movement owed its origins to (a) an ideological hostility to the state provision of education, and (b) to the perceived potential for corporate profits if the state school delivery system could somehow be broken up. The wellbeing of the kids? Never more than an afterthought. There has never been a body of evidence – either here or in the US or anywhere else – to show that charter schools provide better educational results for kids than state schools blessed with similarly generous inputs of funding and resources. Charter schools had never received a mandate from New Zealand voters. They were foisted on us out of the blue in late 2011, as part of the post-election negotiations between National and the Act Party – and in the wake of an election campaign where they had never been mentioned. Given the ideological (and undemocratic) origins of the charter school experiment, it was truly ironic to hear some of the commentariat on RNZ yesterday blaming the government’s well-signalled intention to scrap the charter schools experiment as being (a) ‘ideological’ and (b) a case of kowtowing to evil teacher union bosses, allegedly in order to protect the incompetent teacher comrades within the union ranks from the heat of competition. Because charter schools are always SO competent. Incredibly, this line of mainstream commentary was suggesting that it is incumbent on Labour to show ‘maturity’ now that it is in office, and break its campaign promises to bring the charter schools experiment to an end. In fact… Labour isn’t planning to shut down all the existing charter schools, and the kids themselves will not be cast into the wilderness. 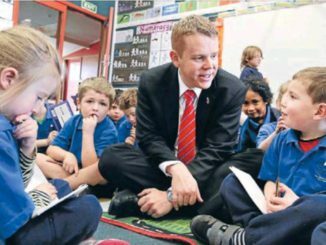 Instead, Education Minister Chris Hipkins has said the schools can be retained on a case by case basis as “ character schools” that will be part of the public education system – provided they are funded on the same basis as state schools, are staffed by qualified teachers, and stick to the national curriculum. Thankfully then, taxpayers will no longer be required to support in perpetuity schools founded and operated for profit, that use (in some cases) unqualified staff, and that get their results (in some cases) by cherry picking their students. In the end, the good charter schools will survive, by being able to show their comparative worth when put on a level playing field with state schools, on issues like funding and staffing. Looming behind the charter schools is the real elephant in the room. For the best part of a decade, the Key/English government has presided over the systematic under-funding of state schools. The combination of low pay and increasing workloads (mainly associated with over-testing) has been driving teachers out of the profession in droves – to the point where we are simply not training enough teachers, especially in specialist fields. Desperately, some schools are filling the gaps with imported teachers; and overall, we are losing 50 % of the teachers that we do train within five years of them starting on the job. The upcoming NZEI and PPTA pay rounds are an attempt to deal with one key element – adequate teacher remuneration – to deal with this recruitment and retention crisis. Plainly, we can’t continue to pour scarce money into a failed experiment that has always been rooted in a hostility to the state provision of education. Meanwhile, that same state school system continues to be degraded, and turned into a profession that fewer and fewer young people are willing to treat as a desirable and rewarding career. The crocodile tears currently being shed over charter schools – even by Bill English, whose support for them while in office was never better than lukewarm – is not an encouraging sign of how the upcoming teachers’ pay round is going to be covered by the mainstream media. If this genuine crisis continues to be framed as a knock-kneed government standing up – or caving in – to Evil Teacher Union Bosses, the teaching profession really doesn’t have a hope. Footnote: The demise of charter schools is being falsely described as a denial of choice. In fact, choice is all but rampant in the New Zealand state education system. That’s because New Zealand went a very long way down this track 30 years ago, with the Tomorrow’s Schools initiative. Those reforms made each public school independent, with very high levels of local parent and teacher involvement in decision making and – drum roll – each school already has its own charter, under which it operates with a board of trustees, and enjoys a high degree of autonomy. On top of that, there is also already provision for such variations as kura kaupapa schools. That is exactly what Hipkins is now re-offering to charter school advocates. Just why a charter school couldn’t fit into this existing framework of almost unlimited choice has always been something of a mystery. Blues songs are about the effects and lifestyle results of being depressed, but surprisingly few blues songs deal directly with the process of depression itself. Bukka White’s “Sleepy Man Blues” is a remarkable exception. It makes explicit connections not only between depression and the desire to sleep al day, but between depression and the panic attacks brought on by having to be yourself, in public. A couple of years ago, the Oakland, California musician Hazel English wrote a simple, powerful song on the same subject. “I’m Fine” is about the gap between the face we present, and the void we can sometimes feel, behind the mask. I don’t know if songs like these “help” anyone, but they are true to a state of mind common to many of us. And that’s one definition of art.